Another year, another edition of Android to look forward to, and those in the know are suggesting that the developer preview of Android P could hit as early as the middle of March. The OS would most likely get pushed out to the world at large at some point during August or September. The news comes courtesy of well-known mobile tipster Evan Blass on Twitter, so we can be fairly sure that Google is at least targeting a release in the next few weeks. However, you'll need to be registered with Google as a developer to get your hands on the software. What we don't yet know is what the P is going to stand for when Google makes the launch official, though there has been speculation that the code is going to get pushed out on March 14, or 3/14 – not far off the value of Pi. Are we looking at a dessert with "pie" somewhere in the name? Maybe, maybe not. Once the early editions of Android P start to hit, we should hear more from Google about the new features that are going to be included: more advanced options for blocking scam calls before they get through have been mentioned, based on code snippets spotted by users at XDA Developers. As usual, the developer previews will be focused on squashing bugs and helping coders get their apps ready for the next version of Android. Most of the bigger features of Android P won't get unveiled until Google I/O, which starts on May 8. 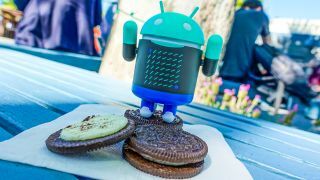 Bearing in mind that Android 8.0 Oreo first appeared as a developer preview on March 21 last year, it's a pretty safe bet that something's going to happen this month. As is the norm, users with Pixel hardware or a phone that's part of the Android One program will get first dibs when Android P arrives in full later this year.